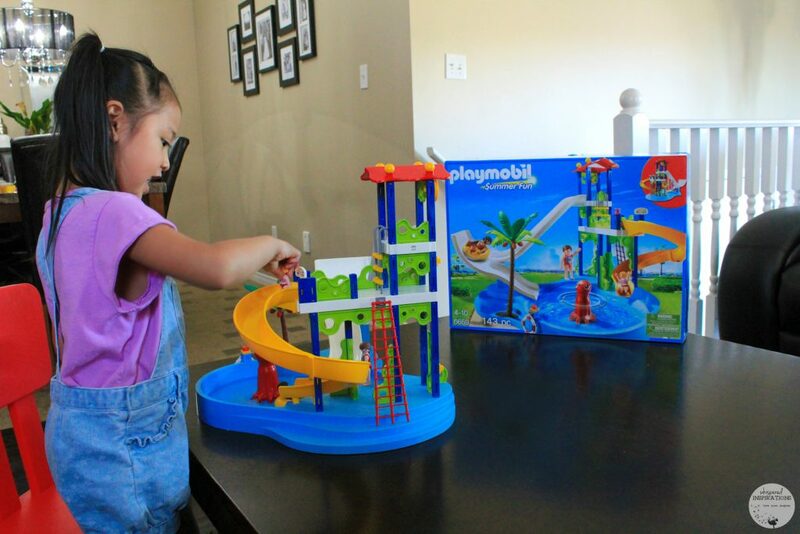 You are here: Home / Product Reviews / Babies & Kids / PLAYMOBIL Water Park with Slides + Giveaway! 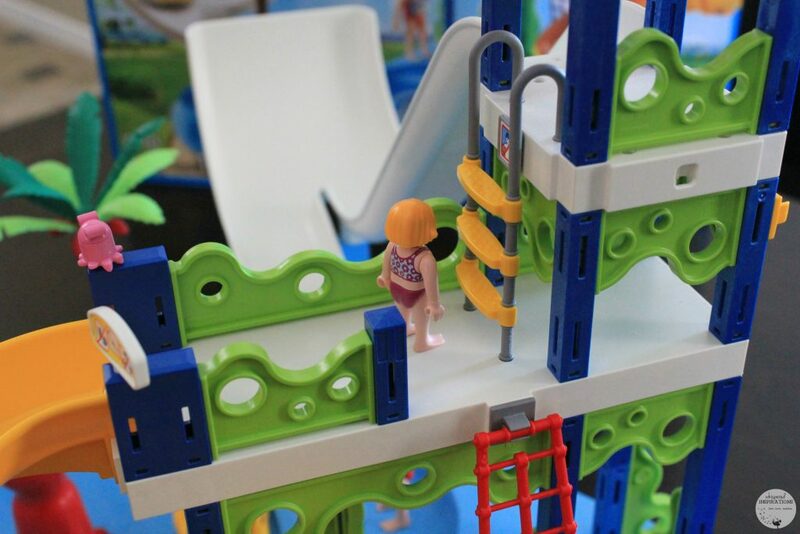 PLAYMOBIL Water Park with Slides! Nothing says summer more than water fun! Not only is it fun to get outside and get wet and wild at water parks or even the sprinkler in the backyard. But, what happens on rainy days or when the kids are trying to unwind? Enter PLAYMOBIL. Play sets that not only help them with their building skills and dexterity, it helps them to expand their imaginations. Plus, it is super fun! 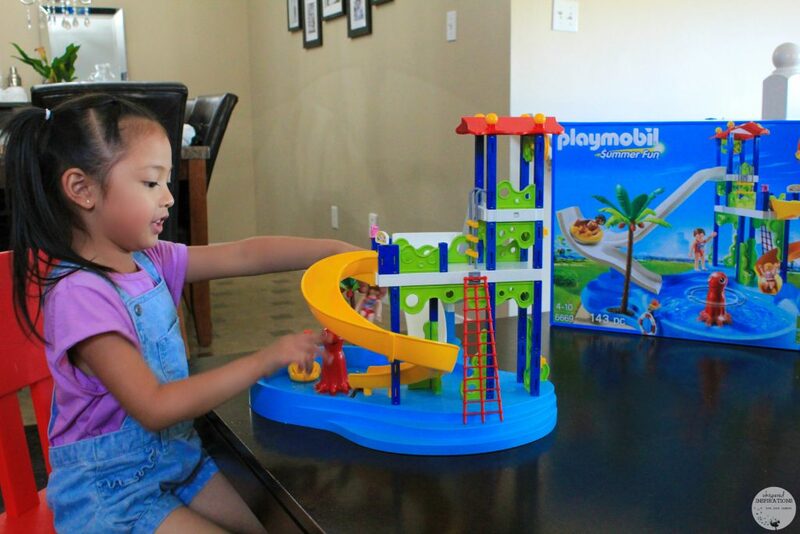 The PLAYMOBIL Water Park with Slides set is one of the sets that Mimi was incredibly excited for. Anything she can add water to, well, she’s totally into! Like all sets, they are filled with details but, there are little accessories that you can pretend to play with. 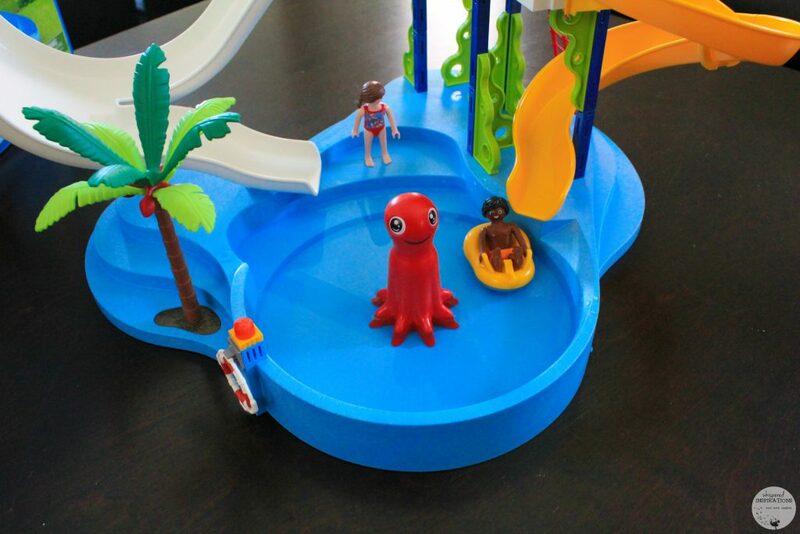 For example, an octopus that you can slide your characters down, the awesome water slides atop rafts and you can even add water inside the big pool so you can add to the effect. Gabby loves this set because it’s so simple yet fun at the same time. Plus she loves playing in the water. Not to mention how easy it is to put together. We all sat down and 15-20 minutes later we’re done! I love watching them play, especially Mimi. They loved playing with both sets and they played with them for hours. Even after the rain passed, Mimi was still playing full-force! Since Mimi is a PLAYMOBIL fanatic, she loved mix matching the characters from the different sets and I think that’s what playing is for! Having fun and watching your child grow up with toys and books instead of phones or tablets! 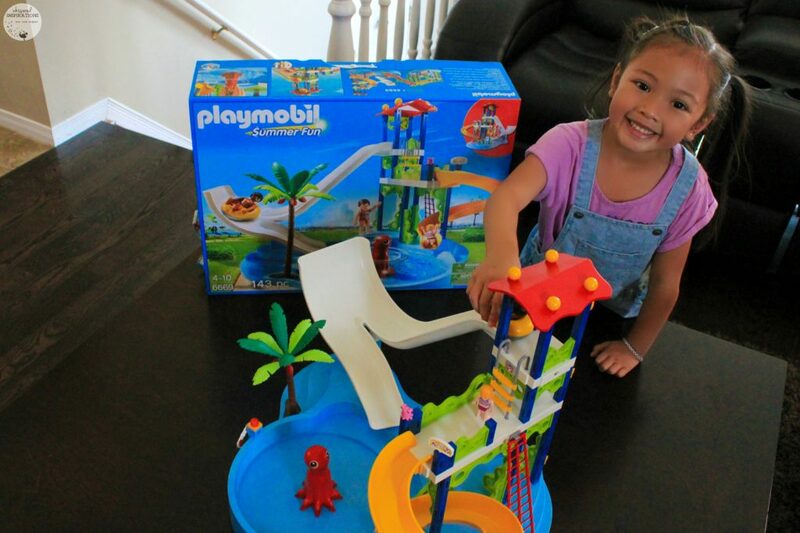 To celebrate summer fun, one lucky Whispered Inspirations reader will WIN a PLAYMOBIL Adventure Tree House. A value of $79.99. Contest opens on August 18th, 2016 and ends on September 2nd, 2016. For more information about this set and others, make sure to visit www.playmobil.ca! Make sure to follow PLAYMOBIL on Facebook, Twitter and Instagram for the latest updates. You can also pick up the set, here. Do your kids love summer water fun? Previous Post: « Let Your Imagination Soar with PLAYMOBIL City Life Large City Zoo + Giveaway! my granddaughter would love this! she also likes all sorts of water play. My kids would like to have this set. My water loving granddaughter would love this toy! My youngest daughter would love it and yes, they all love the water parks. We will be heading to Splash Village here again soon. I am thinking my niece would LOVE this set, she loves toys that she can use her imagination with! I would love to win for my granddaughter, she loves the water and this set she would have a lot of water fun with it!! My son would love playing with this! He loves splashpads and the beach. My daughters love indoor and outdoor swimming. They love going to the lake to enjoy the beach and water but they also love doing the water slide and diving board at the indoor pool. I know my little boy would just adore playing with this. Thanks for the chance! My nephew would love this. We love water fun both indoors and outdoors. My daughter would like it. She loves water play. This would be for my youngest daughter she would love this and play with it for hours and hours. My youngest would love this set! My niece would love this set. Water is her favorite toy! I have a couple of grandchildren that would really like this set. My nephew has 3 little boys and the grand nephews would love to get this set. All my grandkids love playing with any kind of water! My grandson would love playing with this Playmobil Water Park. My grandson would love this,we actually call him the waterboy because anything to do with water he oves it ! My grand daughter would love this set. She spends most of her time in water. My granddaughter would an indoor pool then she could go swimming all year long! I would like to win this for my kindergarten students. This would be for either my niece or nephew! They both would love it. We love spending time outdoors on the water as a family. This would be great for the kids. Thanks for the chance. Sophie would love this set. I would love to win for my granddaughters! This would be an awesome set to play with my granddaughter, she loves the water!! My youngest grandchildren would like this Playmobil Water Slide set. We love outdoor water fun best but we do some activities inside in the colder months! They love playing at the waterpark which is within walking distance from our house. Lucky kids. My youngest grandson enjoys playing outside with his water table and so I think he would like this set. This would be perfect for my niece, ans she loves water play. My grandson would love to have this set to play with. haha,my grandson loves water fun anywhere,anytime and he would have a blast with this toy! My niece would love this Playmobil set! My granddaughter would love this playmobil set and would put water in it for sure. My little cousins would love to play with this!!!! My granddaughter loves the water you just have to mention bath and she starts stripping!! My grandson would love this and he enjoys playing in his bath. The person in my life who would love this would be my niece. My 3 year old granddaughter would love this. They live close to the ocean and she loves going to the beach. My little granddaughter would absolutely love this! It would be a perfect set for my niece! My niece loves to play with her outdoor pool. I know she would love this Playmobil Water Park! My grandchildren would love this set and they all enjoy water and swimming. my step grandkids love playing with water outdoors, would be fun for them! My niece would have a lot of fun with this playset! The grandkids here are big water fan and will play with it when i mind to let them,i like outside best because they can make quite the mess ..
My youngest 2 sons would love this and they love playing with the water, inside AND outside! Thanks for the chance. My daughter would love this Playmobil set. She loves to play with water indoors or outdoors. My niece would have so much fun with this, she loves Playmobil! My water loving grandchildren would like this set. i have a great niece that would sure love this. My grandchildren all like water and take swimming lessons. My niece would absolutely love this set! My grandchildren all enjoy water from swimming in a lake to having water fights in the yard. My niece would have so much fun with this set, she loves Playmobil. My daughters would love this set. My granddaughter loves playing in the water so she would very much enjoy playing with this set!! All my grandchildren love water, beaches and pools. would love to wrap this up and place it under the tree….christams is coming!! my great niece would absolutely love this. My son would love this set. He loves water fun. My niece would really enjoy this playset! My youngest daughter would love this set. My 3 year old granddaughter would love this set. She loves swimming. This would be perfect for my niece, if I won it would be tucked away for Christmas!